The Advance Pricing Agreement provisions were introduced in 2012 through insertion of sections 92CC and 92CD in the Income-tax Act, 1961 by the Finance Act, 2012. Subsequently, the Advance Pricing Agreement Scheme was notified vide S.O. 2005 (E), dated 30/8/2012, thereby inserting Rules 10F to 10T and Rule 44GA in the Income-tax Rules, 1962. Q.1 Under rule 10 MA(2)(ii) there is a condition that the return of income for the relevant roll back year has been or is furnished by the applicant before the due date specified in Explanation 2 to sub-section (1) of section 139 of the Income-tax Act (hereinafter referred to as the ‘Act’). It is not clear as to whether applicants who have filed returns under section 139(4) or 139(5) of the Act would be eligible for roll back. The return of income under section 139(5) of the Act can be filed only when a return under section 139(1) has already been filed. Therefore, the return of income filed under section 139(5) of the Act, replaces the original return of income filed under section 139(1) of the Act. Hence, if there is a return which is filed under section 139(5) of the Act to revise the original return filed before the due date specified in Explanation 2 to sub-section (1) of section 139, the applicant would be entitled for rollback on this revised return of income. 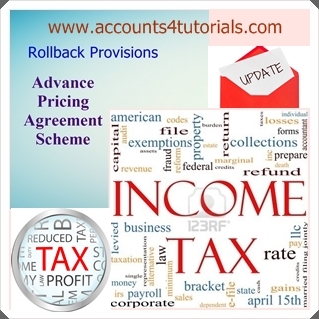 However, rollback provisions will not be available in case of a return of income filed under section 139(4) because it is a return which is not filed before the due date. Q.2 Rule 10MA (2)(i) mandates that the rollback provision shall apply in respect of an international transaction that is same as the international transaction to which the agreement (other than the rollback provision) applies. It is not clear what is the meaning of the word “same”. Further, it is not clear whether this restriction also applies to the Functions, Assets, Risks (FAR) analysis. The international transaction for which a rollback provision is to be allowed should be the same as the one proposed to be undertaken in the future years and in respect of which the agreement has been reached. There cannot be a situation where rollback is finalised for a transaction which is not covered in the agreement for future years. The term same international transaction implies that the transaction in the rollback year has to be of same nature and undertaken with the same associated enterprise(s), as proposed to be undertaken in the future years and in respect of which agreement has been reached. In the context of FAR analysis, the restriction would operate to ensure that rollback provisions would apply only if the FAR analysis of the rollback year does not differ materially from the FAR validated for the purpose of reaching an agreement in respect of international transactions to be undertaken in the future years for which the agreement applies. The word “materially” is generally being defined in the Advance Pricing Agreements being entered into by CBDT. According to this definition, the word “materially” will be interpreted consistently with its ordinary definition and in a manner that a material change of facts and circumstances would be understood as a change which could reasonably have resulted in an agreement with significantly different terms and conditions. Q.3 Rule 10MA (2)(iv) requires that the application for rollback provision, in respect of an international transaction, has to be made by the applicant for all the rollback years in which the said international transaction has been undertaken by the applicant. Clarification is required as to whether rollback has to be requested for all four years or applicant can choose the years out of the block of four years. The applicant does not have the option to choose the years for which it wants to apply for rollback. The applicant has to either apply for all the four years or not apply at all. However, if the covered international transaction(s) did not exist in a rollback year or there is some disqualification in a rollback year, then the applicant can apply for rollback for less than four years. Accordingly, if the covered international transaction(s) were not in existence during any of the rollback years, the applicant can apply for rollback for the remaining years. Similarly, if in any of the rollback years for the covered international transaction(s), the applicant fails the test of the rollback conditions contained in various provisions, then it would be denied the benefit of rollback for that rollback year. However, for other rollback years, it can still apply for rollback. Q.4 Rule 10 MA(3) states that the rollback provision shall not be provided in respect of an international transaction for a rollback year if the determination of arm’s length price of the said international transaction for the said year has been the subject matter of an appeal before the Appellate Tribunal and the Appellate Tribunal has passed an order disposing of such appeal at any time before signing of the agreement. Further, Rule 10 RA(4) provides that if any appeal filed by the applicant is pending before the Commissioner (Appeals), Appellate Tribunal or the High Court for a rollback year, on the issue which is subject matter of the rollback provision for that year, the said appeal to the extent of the subject covered under the agreement shall be withdrawn by the applicant. There is a need to clarify the phrase “Tribunal has passed an order disposing of such appeal” and on the mismatch, if any, between Rule 10MA(3) and Rule 10RA(4). The reason for not allowing rollback for the international transaction for which Appellate Tribunal has passed an order disposing of an appeal is that the ITAT is the final fact finding authority and hence, on factual issues, the matter has already reached finality in that year. However, if the ITAT has not decided the matter and has only set aside the order for fresh consideration of the matter by the lower authorities with full discretion at their disposal, the matter shall not be treated as one having reached finality and hence, benefit of rollback can still be given. There is no mismatch between Rule 10MA(3) and Rule 10RA(4). Q.5 Rule 10MA(3)(ii) provides that rollback provision shall not be provided in respect of an international transaction for a rollback year if the application of rollback provision has the effect of reducing the total income or increasing the loss, as the case may be, of the applicant as declared in the return of income of the said year. It may be clarified whether the rollback provisions in such situations can be applied in a manner so as to ensure that the returned income or loss is accepted as the final income or loss after applying the rollback provisions. It is clarified that in case the terms of rollback provisions contain specific agreement between the Board and the applicant that the agreed determination of ALP or the agreed manner of determination of ALP is subject to the condition that the ALP would get modified to the extent that it does not result in reducing the total income or increasing the total loss, as the case may be, of the applicant as declared in the return of income of the said year, the rollback provisions could be applied. For example, if the declared income is Rs. 100, the income as adjusted by the TPO is Rs. 120, and the application of the rollback provisions results in reducing the income to Rs. 90, then the rollback for that year would be determined in a manner that the declared income Rs. 100 would be treated as the final income for that year. Q.6 Rule 10RA(7) states that in case effect cannot be given to the rollback provision of an agreement in accordance with this rule, for any rollback year to which it applies, on account of failure on the part of applicant, the agreement shall be cancelled. It is to be clarified as to whether the entire agreement is to be cancelled or only that year for which roll back fails. The procedure for giving effect to a rollback provision is laid down in Rule 10RA. Sub-rules (2), (3), (4) and (6) of the Rule specify the actions to be taken by the applicant in order that effect may be given to the rollback provision. If the applicant does not carry out such actions for any of the rollback years, the entire agreement shall be cancelled. This is because the rollback provision has been introduced for the benefit of the applicant and is applicable at its option. Accordingly, if the rollback provision cannot be given effect to for any of the rollback years on account of the applicant not taking the actions specified in sub-rules (2), (3), (4) or (6), the entire agreement gets vitiated and will have to be cancelled. Q.7 If there is a Mutual Agreement Procedure (MAP) application already pending for a rollback year, what would be the stand of the APA authorities? Further, what would be the view of the APA Authorities if MAP has already been concluded for a rollback year? If MAP has been already concluded for any of the international transactions in any of the rollback year under APA, rollback provisions would not be allowed for those international transactions for that year but could be allowed for other years or for other international transactions for that year, subject to fulfilment of specified conditions in Rules 10MA and 10RA. However, if MAP request is pending for any of the rollback year under APA, upon the option exercised by the applicant, either MAP or application for roll back shall be proceeded with for such year. Q.8 Rule 10MA(1) provides that the agreement may provide for determining ALP or manner of determination of ALP. However, Rule 10MA(4) only specifies that the manner of determination of ALP should be the same as in the APA term. Does that mean the ALP could be different? Yes, the ALP could be different for different years. However, the manner of determination of ALP (including choice of Method, comparability analysis and Tested Party) would be same. Q.9 Will there be compliance audit for roll back? Would critical assumptions have to be validated during compliance audit? Since rollback provisions are for past years, ALP for the rollback years would be agreed after full examination of all the facts, including validation of critical assumptions. Hence, compliance audit for the rollback years would primarily be to check if the agreed price or methodology has been applied in the modified return. Q.10 Whether applicant has an option to withdraw its rollback application? Can the applicant accept the rollback results without accepting the APA for the future years? The applicant has an option to withdraw its roll back application even while maintaining the APA application for the future years. However, it is not possible to accept the rollback results without accepting the APA for the future years. It may also be noted that the fee specified in Rule 10MA(5) shall not be refunded even where a rollback application is withdrawn. Q.11 For already concluded APAs, will new APAs be signed for rollback or earlier APAs could be revised? The second proviso to Rule 10MA(5) provides for revision of APAs already concluded to include rollback provisions. Q.12 For already concluded APAs, where the modified return has already been filed for the first year of the APA term, how will the time-limit for filing modified return for rollback years be determined? The time to file modified return for rollback years will start from the date of signing the revised APA incorporating the rollback provisions. Q.13 In case of merger of companies, where one or more of those companies are APA applicants, how would the rollback provisions be allowed and to which company or companies would it be allowed? The agreement is between the Board and a person. The principle to be followed in case of merger is that the person (company) who makes the APA application would only be entitled to enter into the agreement and be entitled for the rollback provisions in respect of international transactions undertaken by it in rollback years. Other persons (companies) who have merged with this person (company) would not be eligible for the rollback provisions. To illustrate, if A, B and C merge to form C and C is the APA applicant, then the agreement can only be entered into with C and only C would be eligible for the rollback provisions. A and B would not be eligible for the rollback provisions. To illustrate further, if A and B merge to form a new company C and C is the APA applicant, then nobody would be eligible for rollback provisions. Q.14 In case of a demerger of an APA applicant or signatory into two or more companies (persons), who would be eligible for the rollback provisions? The same principle as mentioned in the previous answer, i.e., the person (company) who makes an APA application or enters into an APA would only be entitled for the rollback provisions, would continue to apply. To illustrate, if A has applied for or entered into an APA and, subsequently, demerges into A and B, then only A will be eligible for rollback for international transactions covered under the APA. As B was not in existence in rollback years, availing or grant of rollback to B does not arise.